Wood density in radiata pine is often used as a surrogate for stem stiffness and is central to the accounting of carbon sequestration in plantations. FFR recognised the importance of this key variable and commissioned a project to map and model wood density distribution across New Zealand, and to understand how it is influenced by environmental variables. 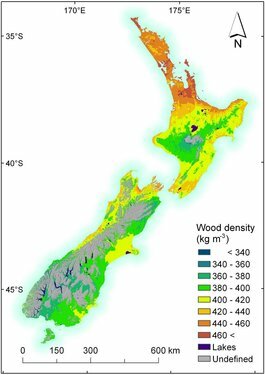 Previous work has provided regional wood density classes but more detailed maps can improve the current state of knowledge; New Zealand plantations are known to be variable in density. Generating new maps linking outer-wood density with stand age and silvicultural treatment, based on site and genetic variables. Estimating log densities based on actual or predicted outer-wood values. This also enables the prediction of outer-wood density forwards and backwards in time. Investigating the need for genetic adjustments in the prediction of wood density to cater for the introduction of specific breeds. Using an extensive dataset, a model was developed to predict outer-wood density. Mean annual air temperature and stand age were found to be most influential on outer-wood density. A national map of radiata pine outer-wood density at age 20 was developed. The map of outer-wood density varies widely across New Zealand with highest values in the warmer northern latitudes of the upper North Island and in the north of the South Island. Conversely, cooler southern latitudes and higher elevations had lowest outer-wood density values. The model accounted for 70% of the variation in outer-wood density at the plot level and over 99% at the regional level. The resulting model can be used to estimate outer-wood density values for new radiata pine growing sites and to feed into the within-tree density model which provides predictions of log densities and carbon content. The map and associated density model will be implemented in Future Forest Research's Forecaster (software) tool.